Because of an accident of birth date and place, I have never been called on to test my courage in war or under political repression. Equally, in the second half of the 20th century in western Europe, my Christian faith has never been tested by torture or fire, only by the temptations of the modern world and by indifference. Christians in England are not imprisoned or killed, just ignored or mocked as oddities. In recent years, there have admittedly been relatively mild acts of persecution. The eccentric English preacher Philip Howard was given an Antisocial Behaviour Order (ASBO) for reading the Bible through a loudspeaker to passers by in Oxford Circus – a ‘breach of the peace’! A couple of years back, a community nurse in the UK was sacked for offering to pray for the recovery of an elderly sick patient. The local Health Trust accuse her of ‘failing to show a commitment to equality and diversity.’ Eventually common sense prevailed and she was reinstated. However, in general, few Christians in the west are severely tested and it is from my privileged position that I have always had a sort of envious fascination for the way so many people are prepared to suffer or die for their beliefs. So what makes a martyr? The first point to make is that nobody can ever be sure how they will react in any given situation. Martyrs are not always people of great courage; their courage arises from their deep faith and often arrives at the last minute. I have always admired Thomas Cranmer, Archbishop of Canterbury and prime mover of the Protestant Reformation in England. He was actually a pretty timid man and, when he was tortured, recanted his Protestant beliefs and ‘returned to the fold’ of Catholicism. Sentenced to death anyway, he withdrew his recantation on the pyre and thrust his right hand into the flames first, saying that this was the hand that had betrayed his faith. 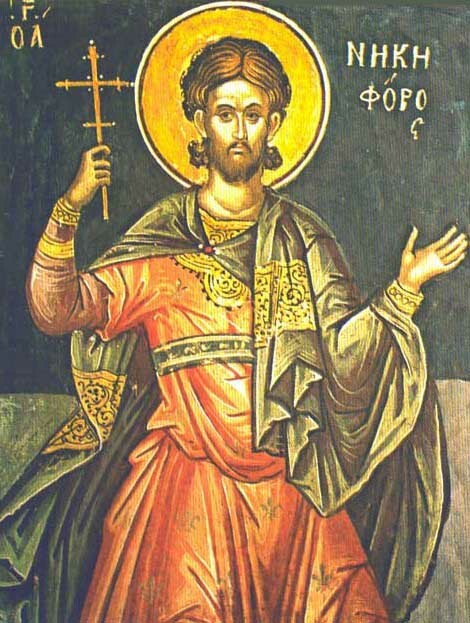 Another 'spontaneous' martyr was St. Nicephoros of Antioch. He and a priest called Sapricius had been close friends from boyhood but at some stage they quarrelled. In spite of Nicephorus's repeated attempts at reconciliation, Sapricius remained unmoved. Then, during the persecution under Valerian, Sapricius was arrested as a Christian and condemned to death. On his way to execution, Nicephorus stopped him and made one last attempt to ask his forgiveness but Salpricius merely turned his back. When he was about to be beheaded, however, the priest lost his nerve and offered to sacrifice to the gods in order to save his life. 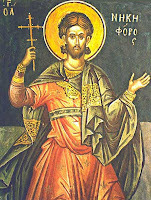 He was immediately released, whereupon Nicephorus openly declared himself to be a Christian and was executed in place of Salpricius. 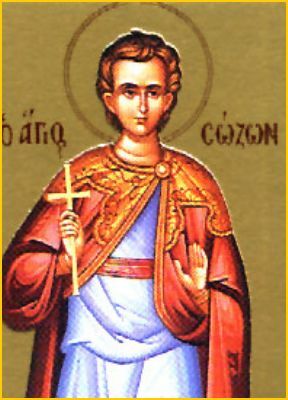 Another characteristic of many of the martyrs, especially the younger ones, is a sort of ‘courageous cheekiness.’ St. Sozon, a teenage shepherd boy had impressed the magistrate with his courage and, with a view to releasing him, the magistrate asked him to play his pipe for the entertainment of the audience. He replied, “I used to play for the sheep. Now I will play only for God.” For this ‘impudence,’ he was burned to death. Although it did not result in martyrdom, something of the same courage arising from deep faith can be illustrated from an unlikely source. When I was at school, a boy in my class belonged to a very strict Protestant sect of the type that I have never had much time for. However, the strength of his faith was such that he would preach and read the Bible to the crowds in the Bus Station on his way home from school – at 12 years old! Needless to say, he had to put up with no end of mockery which caused his classmates to have some grudging respect for him. What turned him into something of a school hero, however, was the fact that, when the Headmaster tried to tell him off for ‘bringing the school into disrepute,’ he stood up to him. For younger readers, it should be explained that in the 1960s the headmaster of a Grammar School was somewhere between the Archangel Gabriel and the Queen to most schoolboys, so a 12-year-old boy arguing with the head was remarkable. John pointed out that, in a Christian country, it could hardly be called ‘bringing the school into disrepute’ to preach the word of God and, when the head brought up his youth, he reminded him that Jesus had taught the elders in the Temple at the same age! So, could I have been a martyr for my beliefs? It is, of course, impossible to say. A certain obstinacy in my nature might give me the courage not to back down, while my sometimes unfortunate sense of humour could get me into trouble. However, a lifelong dislike of pain does make me wonder. If the authorities sentenced me to have my teeth drilled without an anaesthetic, I have a nasty feeling I would recant before you could say ‘auto da fe’. Next week: More on martyrs. As you so rightly say, martyrdom does involve dying, so you're a bit early. The biggest sacrifice in the near future for Western Christians may be creeping marginalisation. Is it our Christian duty to deliberately provoke situations in which we are seriously threatened and persecuted? I'm not a member of Christian Voice nor a huge fan of Stephen Green, but he did do some leafleting which got him put in prison, enabling him to praise the Lord for giving him the opportunity to share in His suffering. Gotta admire the guy! Remember Jerzy Popieluszko. To some of us, 1984 seems like last week. Hey, Chris, could you get a few more people on here? I think about this stuff all the time. Like you, I don't claim any originality. What could be more/less original than God? The academic theologians may be well out in front of us. Who wants to catch up with them? Would that I could. I seem to have a small but regular readership, between 20 and 40 per posting but don't get a lot of feedback.